April is officially World Landscape Architecture Month. All month AHBE LAB will be exploring and celebrating the many facets of our profession, specifically the topics, ideas, and themes which influence our work as landscape architects, both locally and globally. 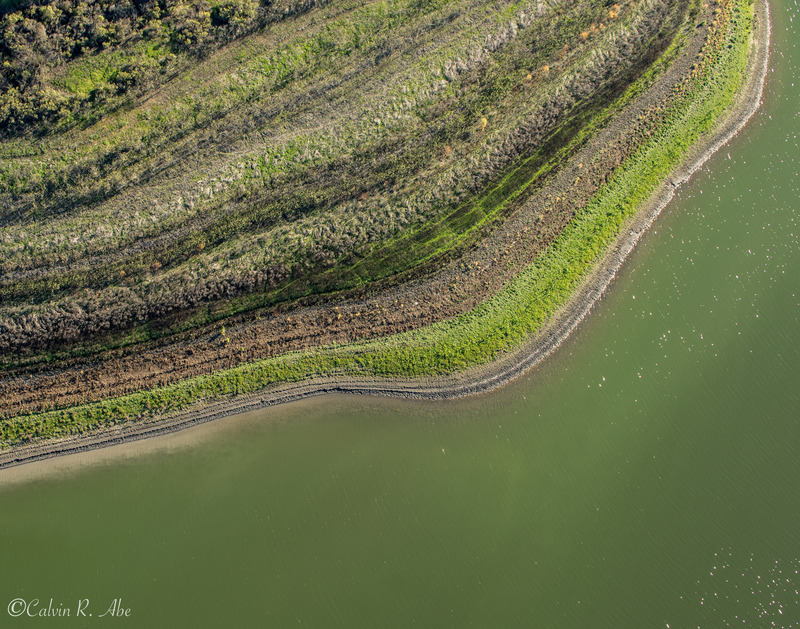 This photograph captured while flying over Lake Casitas, a man-made lake located about 80 mile north of Los Angeles, illustrates an interesting landscape pattern formed by the ongoing California drought. As the water level drops in the lake – at its max Lake Casitas offers a capacity of 254,000 acre ft. – we begin to see how vegetation is associated through its topography. The varying layers of vegetation is due to the mositure content of the soil, topographic elevations, and the physical soil composition. This demonstrates how nature builds an ecology that is interdependent on multiple levels. World Water Day: What Next Now? A surprisingly beautiful topographic view only revealed because the California drought has emptied what was once a vast body of water 80 miles north of California.